Pope Francis has approved the proposal presented by the Archbishop of Canterbury, His Grace Justin Welby, to organize a spiritual retreat to take place in the Vatican, within the Domus Sanctae Marthae, from the 10-11 of this month of April, in which the highest civil and ecclesiastical authorities of South Sudan will participate. A statement released by Alessandro Gisotti, interim Director of the Holy See Press Office, said that representing the civil authorities in the event, are the members of the Presidency of the Republic of South Sudan, who, under the Revitalised Agreement on the Resolution of Conflict in South Sudan, will assume positions of great national responsibility this coming 12 May: Mr. Salva Kiir Mayardit, President of the Republic, as well as four of the five designated Vice Presidents: Mr. Riek Machar Teny Dhurgon, Mr. James Wani Igga, Mr. Taban Deng Gai and Ms. Rebecca Nyandeng De Mabior. Representing the ecclesiastical authorities of the country, eight members of the South Sudan Council of Church will take part in the retreat. His Excellency, Archbishop John Baptist Odama, Archbishop of Gulu (Uganda), and the Reverend Father Agbonkhianmeghe Orobator, S.J., President of the Conference of Major Superiors of Africa and Madagascar, will provide the preaching during the retreat. 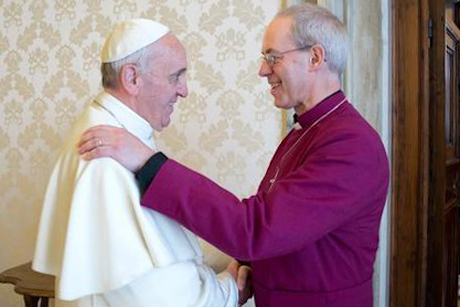 This event, both ecumenical and diplomatic at the same time, was organized by mutual agreement between the Secretariat of State and the Office of the Archbishop of Canterbury, with the goal of offering on the part of the Church a propitious occasion for reflection and prayer, as well as an occasion for encounter and reconciliation, in a spirit of respect and trust, to those who in this moment have the mission and the responsibility to work for a future of peace and prosperity for the South Sudanese people. The conclusion of the retreat will take place on the afternoon of Thursday, the 11th, when, at 5:00pm, the Holy Father will pronounce His discourse. Following that, those participating in the retreat will be given a Bible, signed by His Holiness Pope Francis, by His Grace Justin Welby, Archbishop of Canterbury, and by the Reverend John Chalmers, former Moderator of the Presbyterian Church of Scotland, with the message “Seek that which unites. Overcome that which divides”. At the end, the leaders of South Sudan, who will take up the common task for peace, will receive the blessing.